For those that have not seen it, this week the Linux Action Show did a a wrap-up of their week long Arch challenge. If you are interested in that bit, start here… With praise such as “it is really not that bad”, I guess Arch Linux is doing well! I got two indirect shout-outs. Clearly I am the developer who has an “ounce of contempt“. I live in the metric world, so that is 28.3495g, which seems relatively little. 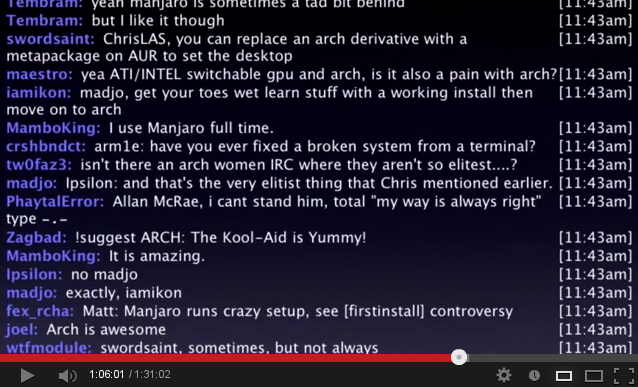 I also get a shout-out in their IRC screen! And to be clear, I am not a “my way is always right type”, it just works out that way.